﻿ Pemedal Beach Resort, Bali | FROM $45 - SAVE ON AGODA! "Amazing staff, very nice and helpful in all matters - we wil..."
Have a question for Pemedal Beach Resort? "Loved this place and our stay- amazing staff- clean rooms, right on the beach." "The location is nice and it's a bit off the crowded Chinese dominated places." "Very clean, good restaurant overlooking the sea." "Beautiful beachfront, friendly staff, infinity pool, clean r..."
Well-placed in the beaches, romance, sports area of Bali city, Pemedal Beach Bungalow provides a most conducive spot for you to take a break from your busy days. From here, guests can enjoy easy access to all that the lively city has to offer. With its convenient location, the hotel offers easy access to the city's must-see destinations. 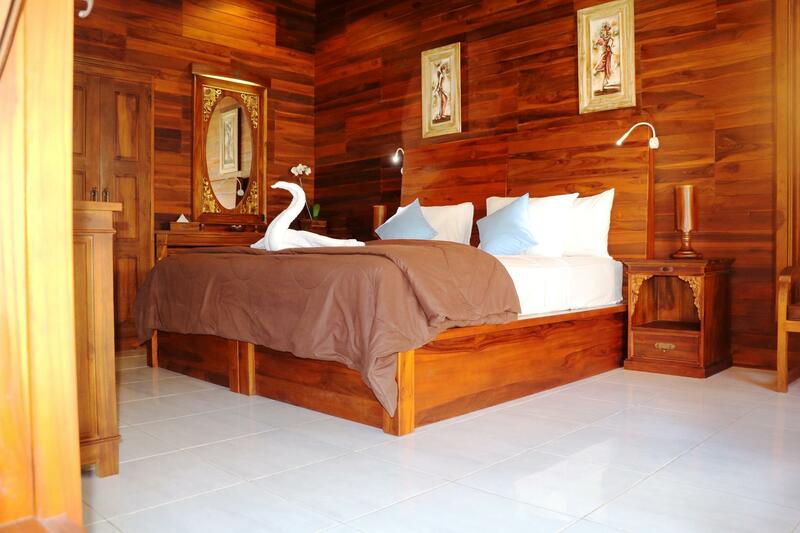 Pemedal Beach Bungalow also offers many facilities to enrich your stay in Bali. To name a few of the hotel's facilities, there are free Wi-Fi in all rooms, 24-hour security, daily housekeeping, 24-hour front desk, luggage storage. 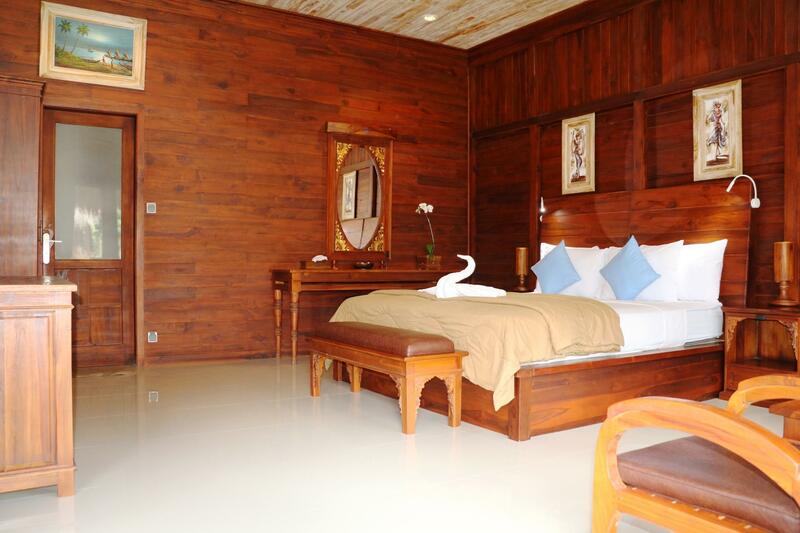 Guests can choose from 20 rooms, all of which exude an atmosphere of total peace and harmony. The complete list of recreational facilities is available at the hotel, including outdoor pool, massage, solarium, garden. Whatever your reason for visiting Bali, the Pemedal Beach Bungalow is the perfect venue for an exhilarating and exciting break away. "The accomodation are like little villas leading out to an in..."
this property has a great location, amazing views and access to the beach. the air conditioning works amazingly, staff is friendly and the pool is perfect. we would go back. our family reserved 6 ''huts'' for 11 people. We will definitely return to this hotel when we come back to Lembongan. When we come Bali which is at least once a year we spend the first few days chilling out on Lembongan and this hotel is a great place to that. Very nice rooms and the pool/beach area was great. Food could have been better but was OK - we stayed 7 nights so after so long we liked a change in the breakfast but that was only because we stayed there so long. Would still recommend it! To make it short. The location is nice and it's a bit off the crowded Chinese dominated places. A scooter is however, recommendable. Staff is nice and they try their best in their capabiities. Villas: Spacious and the bathroom is rerlatively big. We stayed with 3 people and still had enough space in it. The food is awesome, regardless whether it's the free breakfast or a la carte. Try the Indoesian Curry.... fantastic. They have happy hour from 4 to 7pm with 20% off. There's one thing the hotel should think about offering their clients: pickup and transport from and to Mushroom Harbour at a "REASONABLE" price. We got offered transport to the Harbour for IDR 200k for 3 people. This is almost like a transfer from the airport to Ubud. We just walked down to the main road and you can get a transport for 100k for 3 people which is still overpriced but it's okay. If you bargain hard you wil get the transfer for 60k to 80k for 3 people. Some people might say it's impossible but it is, I have proof of it. 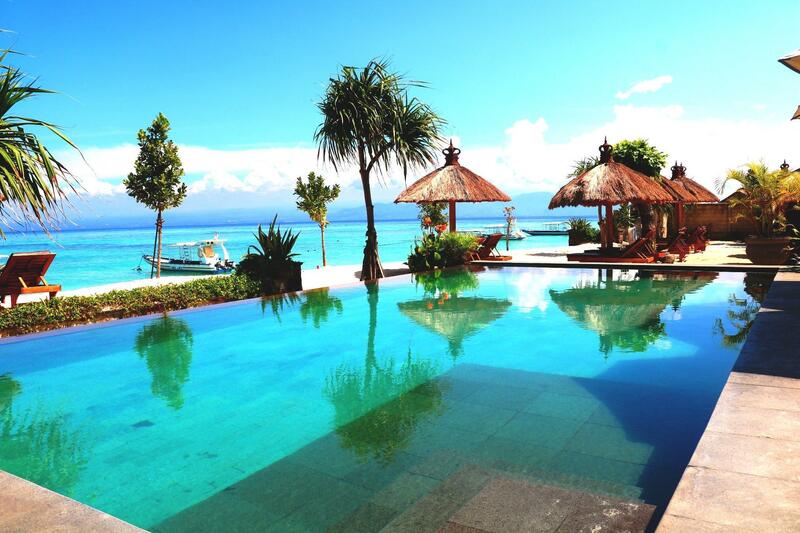 I only want to stay here when traveling to Lembongan. The location was perfect. The pool is gorgeous and they have plenty of chairs and shade on the beach. We definitely plan to come back. The nicest area in Lembongan, you can walk everywhere for food if you are not in to motorbikes like us. Hotel súper confortable and beautiful, and there are really nice restaurants walking on the beach as well. We really loved our stay here. The foods are delicious!!! The room is spacious and classy. The beach is not that great to swim because of the seaweeds found everywhere but they have pool full of chlorine you can swim. Overall our stay is really nice!! Lovely little resort. Rooms were very quaint, clean and have air con. The swimming pool is lovely. The staff very friendly. Breakfast is very simple. Their food is reasonably priced and very tasty. The hotel is on the beach. We instantly had a nice feeling about this place. To have sunbeds with option of shade, beach towels, pool, 24 h reception and a decent restaurant on site makes all the difference on those days when you are staying put at your hotel. The bungalow have a large tiled bathroom, good ac, good bed side lamp for reading, comfy bed and pillows and crispy white and clean bedsheets. We could not care less if there were a little bit of cobweb in the corner of the windows. Staff did a good Job tidying every day and were really nice and pleasant to deal with, in fact all staff on site were very efficient and friendly. We also received great help from the front desk with making phone calls, driver etc. when our son got sick and needed to see a doctor late at night. On our last day it was raining and I could enjoy reading my book on the veranda of our bungalow,overlooking the pool and the sea. You can hire scooters on site for the same price as out on the shopping street so no need to look further. We had an amazing time here. The staff went above and beyond for us and the room was very clean. The bed was comfortable and our room had a fridge. The food at the restaurant was affordable and decent. My only complaint is the rooster that lives behind the room we stayed in. I think there was a point that I wanted to turn it into chicken nuggets. After a while you get used to it but if you are sensitive to noise don't stay in 101-106. Great bungalows, very clean and cozy, perfect location right at the beach and next to many restaurants and bars - do try the food and drinks from their own restaurant as well- excellent! Amazing staff, very nice and helpful in all matters - we will definitely be back! The accomodation are like little villas leading out to an infinity pool which is beachfront. The bar is right next to with a full menu. We payed about 80 a night during peak season at Christmas. It was quite and peaceful. You look straight out to shipwrecks surf spot so there’s always something to watch in the horizon while the kids hunt for shells on the beach. Awesome spot we loved it. Beautiful setting . Room/ chalet style but dark wood so a nice contrast could be lighter colour white sheets bed coverings. Curtains dark brown also so made room look drab. Bathroom was smelly and not enough light or air. Staff were nice but had to ask and request for towels cups to be washed cleaned but they were very obliging. They are very layed back. Staff let you be so not in your face. Breakfast excellent and freshly cooked. Could make it clearer butvonly one choice of drink and main food. We were a bit surprised when asked at checkout to pay bill for food whereas we should have been asked to sign till receipt every morning for the “extra” items we had. Please make it more clearer . We stayed 10 days . Just a few little points but we really felt relaxed safe and had a lovely relaxing stay. We stayed at Pemedal for 4 nights, and it was superb. We were pleasantly surprised at what we're getting for what we're paying. Rooms were really pretty, spacious, and most importantly clean. We also had free breakfast every morning which was very decent (their juices are delicious!). The staffs were super friendly. The location was great, right next to the pool and beach straight out from the room. Only thing to note is that from the hotel to the street, you would have to walk through a dark alley of sort (though very safe), as the street is on the other side of the hotel. But that would be the same with all the hotels there due to the local villages placed in between the hotels and the main street. 10/10 would stay here again. Very comfortable stay. Bugalows were a great size, clean, comfortable and quiet (with the exception of the roosters in the morning). Very cosy resort, with friendly and helpful staff, right on the beach front and great views. Room was ok, there's satellite TV, air-con was working well and basically everything that makes a basic place to stay was present and working well. Restaurants are everywhere so u won't have to worry about walking distance.